Activists reveal police arrested or detained 84 Jews in just 7 months, part of escalation in last 2 years they say encourages Arab terror. New figures released by Temple Mount activists reveal that police have escalated their arrests of Jews at the holiest site in Judaism, with a total of 59 Jews arrested in the last seven months. 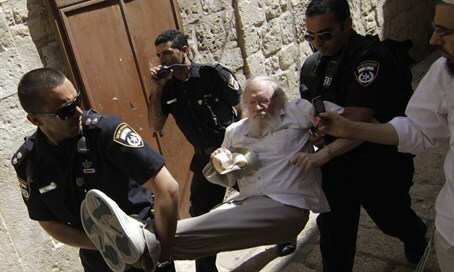 Another 25 Jews were detained for questioning by Jerusalem district police leaving a total of 84 arrested or detained, according to the list compiled by the organization "Yirah" that encourages ascending the Mount, which was reported by Walla on Friday. While Israeli law stipulates freedom of worship, police have been following the discriminatory prayer ban dictates of the Jordanian Waqf, which continues to hold de facto control of the holy site even after Israel liberated it in the 1967 Six Day War. Jordan recently got the Israeli government to put cameras on the Mount, which Amman says only it will be allowed to access; recently Jordan said it may sue Israel at the International Criminal Court for "violations" at the site. According to Temple Mount activists, each year only a few dozen Jews were arrested on the Temple Mount for the "crime" of praying, but that all changed in the last two years, as a spike in arrests has been documented. "The number of arrested would reach 50 a year, no more," said Rafael Morris of the "Return to the Mount" organization, who was investigated by police for promising to pay compensation to Jews who are arrested for praying on the Temple Mount. "The police are not interested in this conversation (about prayer rights - ed. ), and are not releasing announcements on the arrests, and when they do, they say they 'violated the visit regulations,'" explained Morris. The latest arrest took place on Thursday, when a 13-year-old boy who recited the Shema prayer was arrested by police, and late last month an activist was arrested for having his hands upraised. A hidden camera expose last month revealed how police discriminate against religious Jews on the Mount. The Al-Aqsa Mosque on the Temple Mount has been used as a key incitement tool by the Palestinian Authority (PA) in riling up the current wave of terror, with PA Chairman Mahmoud Abbas calling last September to use violence to block Jewish "filth" from the site. Morris argued that the police actions arresting Jews on the Mount "encourages the Arabs - their pressure works. A situation has been created in which they come to the officers and say: 'look how he mumbled,' 'look how he moved.' It isn't (Jewish) 'provocation' leading the intifada, but rather how the police arrest us and show the Arabs that their pressure works." "That's what encourages the violence. If every time that the Arabs rioted they gave the Jews more rights - the Arabs would stop immediately." Police have arrested Jews not only for praying on the Mount but also for "Jewish customs," which has even included carrying dried fruit on Tu Bishvat which police declared a "forbidden religious symbol" - Jews waving Israeli flags have also been arrested. Jews have even been banned from the site for bringing grape juice, and in December 2014 a Jew was arrested for asking police to enforce the law and stop Muslims playing soccer at the site. In contrast, police have turned a blind eye to the destruction of Jewish archaeological finds by the Waqf as well as illegal Muslim construction, and have responded with relative restraint to repeated violent rioting by Islamist gangs funded by Hamas.